Tethered-free, automated offices are becoming the norm. From company-wide wifi, to automated lighting and mobile charging stations, digital technology is at the forefront of workplace design. The tech-enabled smart office not only promotes flexibility, comfort and productivity, but also reduces energy costs — it’s a smart strategy for improving employee wellbeing and the bottom line. Lighting —Smart lighting is ubiquitous and a standard component in office design. Smart lighting systems can be dimmed through daylight and occupancy sensors for cost and energy savings. They can also be automated to influence the intensity, color and light temperature in order to create more comfortably lit workspaces. Temperature —Climate-controlled offices can affect employee’s overall health. Self-regulating and self-monitoring thermostats ensure that temperature is at a comfortable level throughout the day. As with other Internet of Things (IoT) devices, programmable, internet-connected thermostats can help reduce energy costs while maximizing occupant comfort and well-being. Design —An aesthetically pleasing and “agile” office favorably affects employee productivity and wellbeing. Whether incorporating biophilic elements and wall graphics, or sourcing attractive furnishings, accessories, and well-appointed work stations that adapt easily to the occupant (think height-adjustable surfaces), beauty and function are elements of smart design. 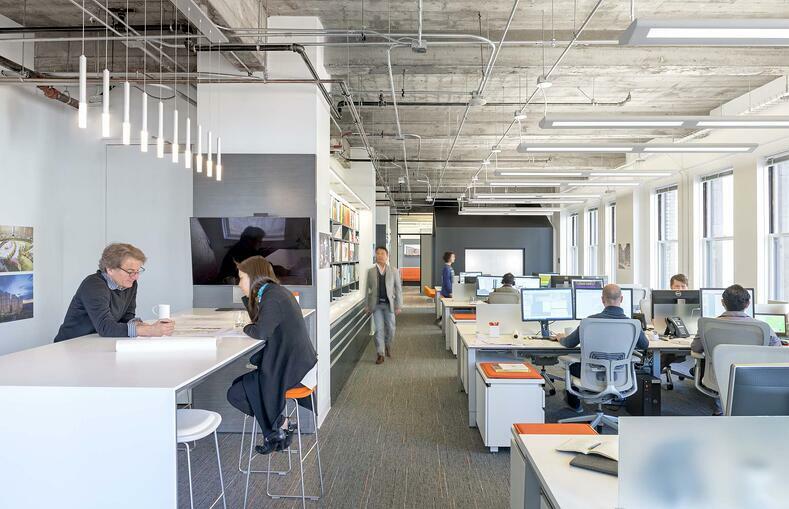 We’ve worked on some of the most attractive, smart spaces such as Shawmut and M Moser SF . Storage —Smart storage utilizes space planning and creative design to make storage units functional as well as blend with the decor. Removing clutter and keeping files organized positively impacts the work experience. We’ve sourced and installed a variety of smart storage from sleek, sturdy filing cabinets, to workstations with built-in shelving units and design-forward modular units with easy access. Whether your company is undergoing a major effort to transition their workforce into a free-address environment or you’re designing a new smart building, Unisource Solutions understands that smart offices can improve employee performance and give companies a competitive edge. Contact us for a free consultation and learn how we can help you achieve your smart office goals.